The following may sound complicated and seem time staking, but honestly, it’s not. It’s a breeze to make and delicious. It’s great for anytime of the year. So give it a try and enjoy. 1 Lb. tiny boiling potatoes unpeeled and cut in 1/4 inch slices or the slightly larger white Yukons or something similar, peeled, cut in half and then cut cross wise in 1/4 inch slices. Directions: Boil until potatoes are JUST tender (maybe 10-15 minutes). Drain, put in stainless or glass bowl and add the broth and salt. Let set while you do the rest. 7. Directions: Place ingredients in a blender or processor and process till smooth or if you wish, you can just whisk it all. 1/2 Lb. smoked sausage such as Kielbasa, quartered lengthwise and cut crosswise in 1/2 –inch slices. French garlic sausages are the best if you can find them. Directions: In a large non-stick skillet, place sausage slices and over medium heat cook, stirring occasionally, until the slices are brown and warmed through—about 3 minutes. Remove the slices and drain on a paper toweled plate. Place aside. 1/2 C. chick peas—if not freshly cooked, canned drained and well rinsed. Toss the potatoes with 2 Tblsp. of the dressing and the parsley. Toss the romaine with the remaining dressing. 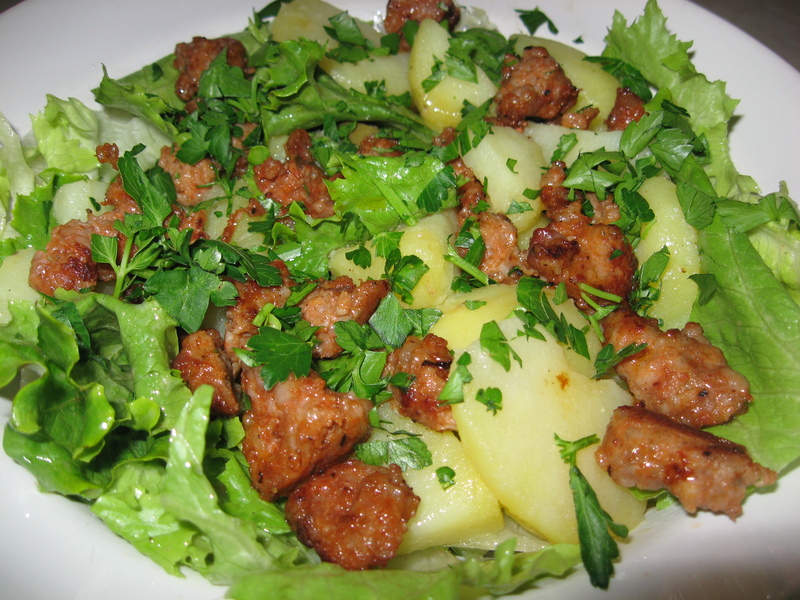 Put the lettuce on plates, top with the chick peas, potatoes, and olives and finally the sausage slices. @ 721-3551.Margot is a self-taught enthusiastic & passionate cook. Having been an inn-keeper for 5 years at her own inn, she accumulated a lot of good recipes which she loves to share.